Although Tom Dennison was indicted and tried over the course of two months, the trial ended in a hung jury, and Dennison would never be convicted. Still, this pretty much spelled the end of the Dennison machine. Tom suffered a stroke in early in 1932, and the damage from this was said to show visibly throughout the trial. Later in the year he came down with pneumonia, would be divorced from his teenage bride, and within two years of the trial’s end would be dead. Despite a few attempts to find an heir-apparent Dennison was never able to establish a line of succession and the machine fell apart once he wasn’t there to keep it running. Pretty interesting stuff. KETV seems to have the story of record here about the exhibit. Also of note is that Orville D. Menard has a new book coming out in early November from Bison Books. 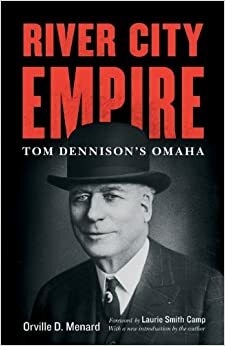 Menard’s Political Bossism in Mid-America, essentially a biography of Tom Dennison that was first published in 1989, is the go-to authority on all matters Dennison. His new book, River City Empire, appears to be a reissue of his previous work, particularly since the page counts only differ by ten, and a foreword has been added. In any event, Menard has mentioned in talks before that he’s still been working on the material since his first came out, so I’m interested to check out the new book. More than anything it’s great to see renewed interest in this fascinating figure of Omaha history–one who just happens to be a main character in my novel! Hi, Norene. I haven’t heard of Cigars and Wires–but will check it out. Thanks!